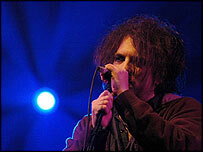 Two members of UK Goth-pop band The Cure have left the band, bringing the decade old line-up to an end. Guitarist Perry Bamonte and keyboard player Roger O'Donnell are out, leaving frontman Robert Smith, bassist Simon Gallup and drummer Jason Cooper. The Cure's 26-year career has long featured a revolving door of musicians backing Smith. A statement on the band's website said the three remaining members will perform at their forthcoming shows. It also hinted that other musicians would be joining them. The new line-up will be unveiled on 5 August when the Cure play a festival in Castellon, Spain. The band is also confirmed for festival dates in France, Switzerland and Turkey. O'Donnell first played with The Cure from 1987 to 1990, when he was replaced by Bamonte, a Cure roadie. Bamonte switched to lead guitar after Porl Thompson left in 1993, and O'Donnell returned to the fold in 1995. In a statement on his website, O'Donnell wrote: "As of Tuesday this week I am no longer a member of the Cure. "It was sad to find out after nearly 20 years the way I did but then I should have expected no less or more."